Tickets to this event aren’t for sale, making them extremely exclusive and highly sought-after. Hopeful entrants must visit one of our business sponsor's locations in order to enter for their chance to win. That’s right: This event could send hundreds of consumers directly to your door! Due to the nature of this process, being a Bussin’ It To Busch sponsor is a highly attractive opportunity! Read on to learn our top ten reasons that businesses should want to attach their name to this wildly popular event. Since sponsors hold the only opportunity for consumers to enter to win Bussin’ it to Busch tickets, it goes without saying that these businesses will experience a significant increase in foot traffic. Sponsoring businesses have the unique opportunity of inviting hundreds of people to walk through their doors. When else can you offer such a sweet deal for showing up to your business location? This foot traffic can not only lead to on-the-spot sales, but it can also result in an overall increase in brand awareness. Since people must enter their contact information in order to win, businesses will end up with their own lead list that they can re-market to, even after the event ends. Collecting email addresses and loading them into a database can drastically improve your ability to consistently follow up with the leads. Businesses can also use this unique opportunity to offer entrants some sort of promotion or discount to their business. This is an easy way to encourage consumers to return and do future business with these sponsors. Consider offering 20% off a product or service or even a free t-shirt. People love freebies and this kind of goodwill will only encourage future sales! Whether you’re a die-hard fan or not, most everyone will admit that Cardinals baseball is one of the most popular teams in America. What business would not want to be associated with that level of fame? The St. Louis Cardinals are near and dear to most mid-Missourians and sponsors have the benefit of helping these baseball-loving consumers get to see their favorite team play. Talk about a homerun marketing move! There’s something about a local sports team that gets any community excited, especially in a rabid sports city like St. Louis. But what you might not realize is that tying your marketing efforts to a local team can pay huge dividends. Being associated with a winning organization or team creates positive brand equity in the minds of consumers. This will cause them to see your business as a winner as well. 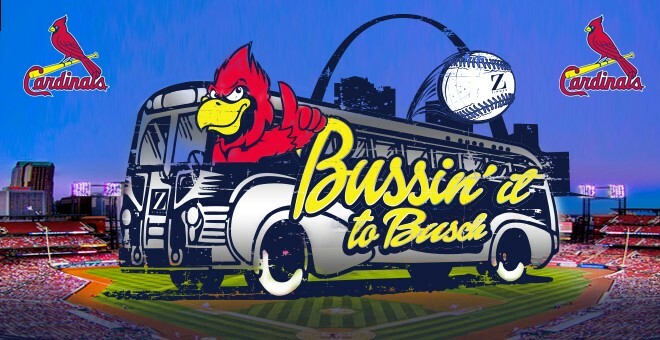 There’s no doubt about it: Bussin’ It To Busch is one of our most popular events of the year! With so much goodwill already built in to this event, what business wouldn’t want to take advantage and be associated with it? Just how popular is it? Since our radio stations give so many prizes away, we have a policy that limits one person to only winning one prize in a 30-day period. Recognizing that, many listeners have told us that they refuse to participate in any other contests within the 30-day window of Bussin’ It To Busch. That’s how badly they want to be on that party bus on their way to see the Cardinals play with our radio personalities. Not only will business sponsors' names be promoted on the radio, they will also be listed on station sites, Zimmer's site, and on social media posts. Remember: it takes a minimum of 3 times a week for your business’ name to resonate with a consumer. Why not take advantage of getting promotional mentions, E-blasts, social media posts, and more all at once? Being able to mingle with consumers, whether at your business’ location or at the game itself, is a unique networking opportunity that could lead to future connections. Also, remember that there are other sponsors involved; these connections could also lead to future partnerships or collaborations later on down the road. There’s no limit to what can happen when businesses branch out and get involved with popular events like Bussin’ It To Busch. Each sponsor will receive their own Bussin’ it to Busch tickets and will have the option of attending and mingling with all of the attendees themselves, as well as other sponsoring businesses. As we mentioned above, this kind of networking could lead to connections for potential business in the future. Putting your face out there at such a fun-filled event is sure to spark some attention with consumers and other local businesses alike. This one’s obvious. Who doesn’t want to see the St. Louis Cardinals play, all while being chauffeured there and back? Plus, this is your chance to participate in a once-a-year event and get hundreds of people to your business location. The excitement alone is just the cherry on top! We hope these reasons have further proven why becoming a Bussin’ It To Busch sponsor should be one of the easiest decisions your business makes all year long! Don’t strike out and let such a unique opportunity pass you by!